I am too poor and unfortunate a man to be included in the great bench building ventures of our time. 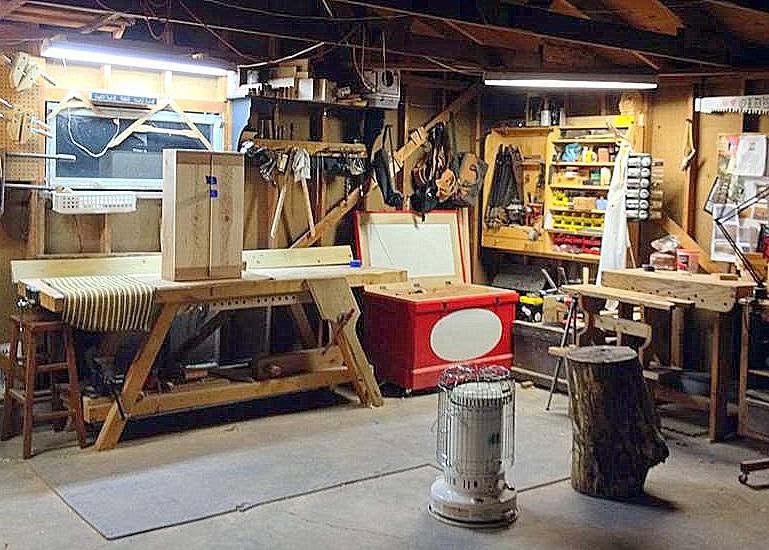 Namely the French Oak Roubo Project (FORP) which is now in the start up of its second iteration while I jealously watch from the digital sidelines. For, at least the last year I have been seriously weighing my options when it comes to building a new work bench. I built my current bench at a transition point in my life. 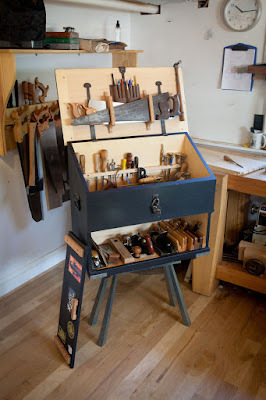 Tired of tooling around learning how to do a little of this and a little of that, I decided I would focus my creative endeavors on woodworking, something I had played with and enjoyed, but now set forth to attempt to master. At this time I also started blogging about my work and time in the shop. At the time I thought this was a unique idea (little did I know what I was getting myself into) My current bench, a hybrid idea between the Nicholson Workbench Chris Schwarz shows in his original blue workbench book and a bench he built called "The $175 Workbench". Made from pine with a laminated 2X4 top. The original, just finished circa summer 2009. Time rolls. Lessons become knowledge. You know you can do better. I've made modifications. My bench as it sits today, in my perfect little corner of the world. I upgraded/replaced the leg vise chop when it broke, and added a rail of holdfast holes to the underside and a cheep inset planing stop the raises and lowers with a thumbscrew. I knew we were going to move after I built the bench, so in my naivete I didn't make the connection between the legs and the bench top very solid. In fact the legs are slanted boxes that attach to the top with lag bolts and the bottom shelf with carriage bolts. Not exactly bomb proof joinery. So the bench racks a bit when planing. I solved that by screwing it to the wall! The second and larger problem. The top has warped over time and not just a little bit. Enough so planing it flat is less than feasible to it's survival. It's not that I can't work on it, and can't work around it. handling long stock is the only real time its a big issue. Mostly I'm just tired of settling and working around the issues included in something I could have, should have done better. So I've been pining for a second chance, a new bench with no compromises, but finding the right materials is the tricky part. The combination of patience and fate has delivered the materials to my doorstep. The new workbench in its infancy. A week and a half ago, some folks I know dropped me a line, they had an old barn they had to burn down because they were selling the property it was on. As an after thought they thought I might like to salvage some material from it. If I'd had a few months time I'd have salvaged every usable stick, as it stood I had a one day window. I called a buddy and we went and got some beams. I believe they are some softwood variety, which is fine with me. The big beam in front is a little more than 8x8 square. It will be the legs. The three thinner beams are around 4x8. Those will be edge joined together to make the top. They all come out to about 12 foot 4 inches long. That means when I'm finished, unless I find something punky or bad. 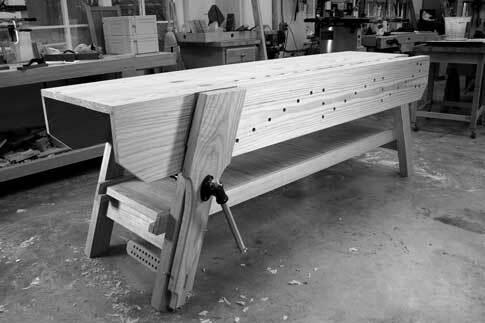 I have a chance at a workbench 12 feet in length and a little less than 24 inches wide. 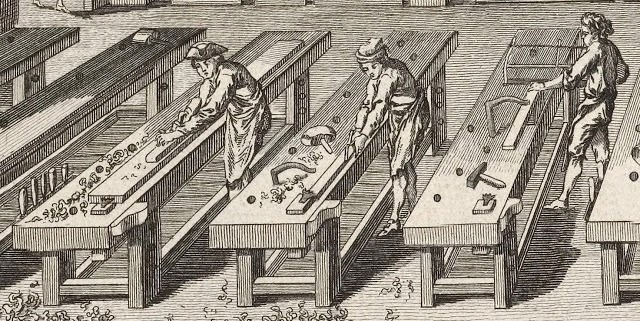 A close up of the row of benches show in Roubo's infamous plate 11 etching. That should work just fine. It'll mean rearranging the shop something fierce, but it will be a nice problem to have. I've got a lot of nails to pull today and then the beams are going to have to wait for a little while. Maybe even the whole winter long, but soon I'll be starting and there will be no compromises this time. Get a metal detector! Nails are too easy to miss and regrinding plane irons is not the most fun job. Lee Valley's got a cheap one. 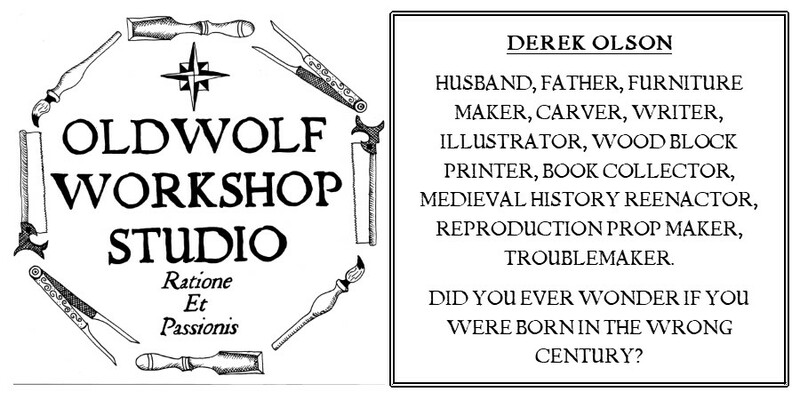 Looks like you'll be having a lot of fun, Derek! Can't wait to see the updates.